The Ordinary Life of an Extraordinary Girl: Shouldn't everyone have the opportunity to shine? Shouldn't everyone have the opportunity to shine? Most of my recent posts talk about the International World Winter Games in South Korea. 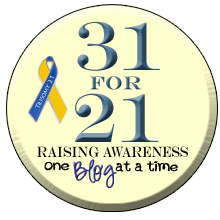 If you have time, you might be interested in reading about this life opportunity a 19 year old girl from Carbondale, CO by way of Deerfield, IL had. 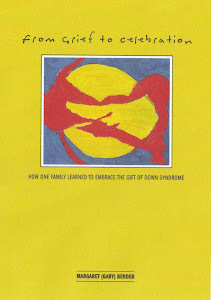 Oh - did I mention this is my daughter and she has down syndrome? 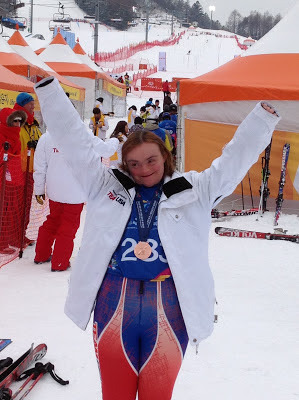 I LOVE the Special Olympics, it is a place where Alex and thousands of other athletes from across the world can shine. It is a place where people with and without disabilities celebrate their contributions to the organization and their communities. It is an opportunity for the world to learn about acceptance and awareness. It is NOT about people with disabilities as many claim, the Special Olympics is a huge catalyst for change for inclusion of people with disabilities in our communities. This past week was Colorado Winter Games, the final competition for the 2012-2013. 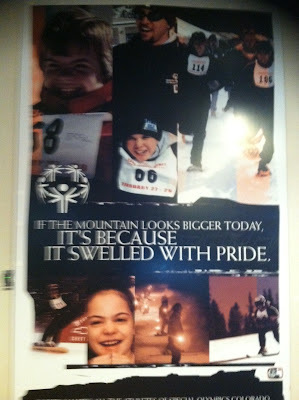 The games where held at Copper Mountain and attended by hundreds of athletes from across Colorado. This has been the BEST season Alex has ever had in terms of learning independence, good sportsmanship and what being on a team really means. Alex has learned those life skills she did not learn in High School, she has grown and matured. When I saw this poster at Copper Mountain it spoke to me. Is this what I have been trying to say all this time when people asked me about why the Special Olympics is so important?